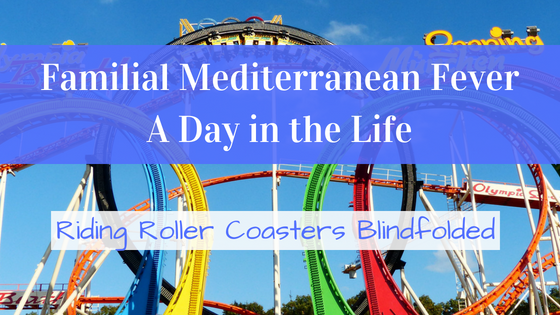 Living with Familial Mediterranean Fever goes a little something like this: The day was well planned. Work, lunch with friends, then a little yard work. It was going to be a good and productive day. Then I woke up, and everything changed in an instant. 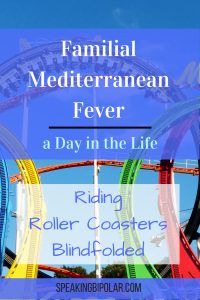 Coping with Familial Mediterranean Fever (FMF) is a constant roller coaster. Perhaps the worst part is that most of the time you have no idea what is coming. It’s like getting on the scariest roller coaster blindfolded. Disclaimer: I am not a healthcare professional. This blog shares my personal experiences and those of other patients in living with chronic and mental illness. 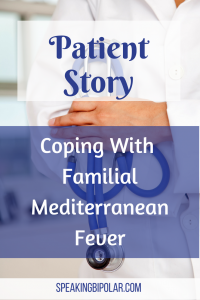 For more information on Familial Mediterranean Fever, visit the FMF & AID Global Association or another medical website. Today’s post is about a typical day of living with FMF while experiencing a flare, or attack, as they are more properly known. You can read more about FMF and it’s signs and symptoms by clicking this line. As with any disease, each patient’s experience with FMF can be very different. There are a lot of similarities between patients, though, so you may well relate to this post. This post is going to concentrate on my personal experience during a typical FMF day. Usually, I know what kind of day it is going to be as soon as I open my eyes in the morning. Sleep can be a big problem with FMF. During the attacks, the pain may be so intense that sleep is near impossible. On the better days, I do sleep, at least some. My attacks seem to almost always start during the night. I wish I knew the cause for that so I could change the trigger. Once consciousness starts setting in, either pain or nausea will quickly let me know it’s going to be a bad day. On the pain side, it’s very much like having the stomach flu. The fever causes chills that frequently causes me to shake. It also causes aching body pain. Everything hurts during an attack, but depending on where the inflammation is attacking, the most intense pain can be localized to specific joints or areas. Pain in the abdomen is most common. Neck, shoulder, and chest pain are also regular occurrences for me. An attack is usually accompanied by dizziness or vertigo. Just as a side note, there is a difference between being dizzy and having vertigo. Dizziness is a lot like that light-headed feeling you get when you stand up too quickly. It’s annoying and can limit some activities, but usually, you can function with it. Vertigo, on the other hand, is more of a constant spinning. 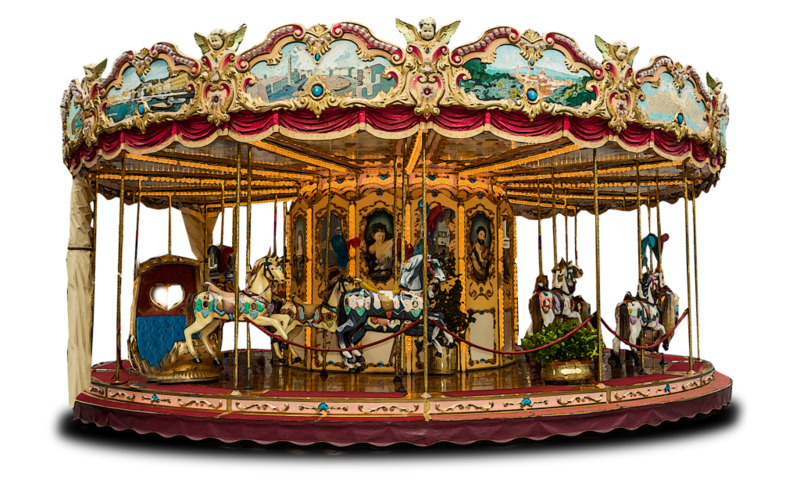 It’s like getting off a merry-go-round that has been going too fast. Things continue to spin even once you get off. Vertigo causes the spinning sensation even while sitting or laying down. It’s not uncommon for vertigo to induce vomiting. There are two schools of thought on the causes of nausea. One doctor told me that the inflammation pressing on my organs was the cause. However, a nurse, who herself lives with chronic illness, explained that nausea and dizziness are common reactions when your body is dealing with immense and prolonged pain. Think of slamming your finger in a car door. If you’ve ever done it, you know how fast pain can make you sick. I tend to agree with the nurse on this one. Disclosure: This post contains affiliate links. If you make a purchase through one of these links, there is no additional cost to you, but I may receive a small commission. Thank you for your support. It helps to keep the lights on. It’s Going To Be a Bad Day. Now What? Now I’m awake and there is no doubt that it is going to be a bad day. If I can, I get out of bed and get a shower. Somedays, taking a shower takes everything I have. After the shower, I drag myself back to bed where I spend the rest of the day. If I had appointments or work scheduled, I have to find a way to contact everyone to let them know that circumstances have forced me to change my plans. Pain causes your mind to be fuzzy and disoriented, making this task harder than you might suspect. I hate taking pain meds. They are typically bad for your kidneys, stomach and liver, so I try to take them only when I have to. If the pain is so severe that I cannot lay or sit comfortably, I will probably start with Aleve Liquid Gels. The liquid caps seem to work best for me, though that may be all psychological because it’s the same medicine as the tablets. If a few hours pass with no improvement, I will break down and take a Tramadol. It’s not extremely effective at fighting FMF pain, but it’s usually enough to take the worst of the edge off so I can at least rest. 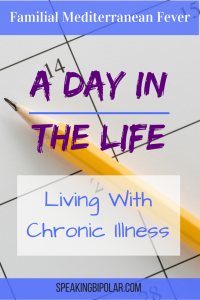 You have to learn your own body’s needs when you have a chronic illness. FMF has caused me to have mild gastroparesis. Gastroparesis is a partial or complete paralysis of the lower part of the stomach. The lower stomach is supposed to grind food so that it can easily pass into and through the intestines. With gastroparesis, the stomach either doesn’t grind at all or grinds very slowly and on a limited basis. That means that hard to digest foods like meat or fresh fruits and vegetables can sit in your stomach for hours or days. More pain with more discomfort and more nausea result. If you have gastroparesis, there is a great book, Living (Well!) with Gastroparesis, that offers excellent tips on how to cope successfully with the condition. You can read it for free if you have a Kindle Unlimited subscription. I have to believe that the cause of my gastroparesis is the FMF. During an attack, it is much worse. So, while I am laying there in bed, I have to decide if it is worth eating anything, and if so, what can I eat without getting sick. On the worst days, I usually choose not to eat at all. I make sure to keep plenty of fluids (water and juice) in my system but avoid solid food completely. I also have a Ninja blender that I love, so I frequently make smoothies. They rarely create digestive issues for me. That said, there is a lot of weakness that comes with an attack. Fasting seems to add to the weakness, so that also has to be carefully weighed when deciding whether to eat or not. An attack can last from 2-7 days. Each day of the attack tends to be unproductive because either nausea, dizziness or pain make doing anything extremely difficult. Friendships suffer because I frequently have to cancel or change plans at the last minute. I miss a lot of outings and parties and often don’t talk to friends on the phone as much as I would like. The attack eventually ends, though. However, the cycle does not end with the reduction in fever and inflammation. There’s one more fun part of an attack for me. Of course, I use the word “fun” ironically here. Inflammation during an attack usually is most concentrated in the abdomen area. It frequently causes mild to moderate constipation. Not really a big deal at the time, because the attack causes so much pain that you try to make as few trips to the bathroom as possible. However, when the inflammation subsides, things start moving again and often quite quickly. That means that even though I may be feeling better, I am still stuck at home for another day, or at least much of the day because it is unwise to be far from the bathroom. 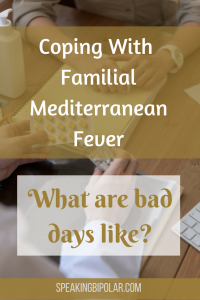 It may seem like an oddity for me to share my experience about what a bad FMF day is like. I do it for two reasons. One, if you are suffering from a chronic illness, I want you to know that you are not alone. There are other people out here dealing with the same struggles every day and trying to keep going in spite of them. That is the absolute worst thing you could ever say. ABSOLUTE. WORST. THING. When you are chronically ill, you already struggle with feelings of unworthiness and low self-esteem. When someone says you don’t look sick, it implies that you aren’t really sick. All validation is taken away from you. But you are sick, and so am I. 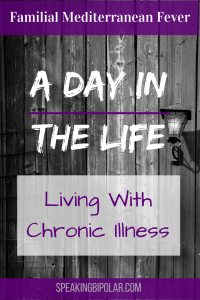 With that in mind, I am sharing my experience so that healthy people can get a glimpse into the private life of someone that lives every day with a health condition. Hopefully, it will help to create more understanding and compassion. Blogs grow in popularity primarily through word-of-mouth and social media sharing. If you found this post meaningful, please share it. I appreciate that you have stopped by my blog and taken the time to read this article. Please share your thoughts in the comments below. There is a diet that may help. It is called The Specific Carbohydrate Diet. It has really helped me with a lot of these gut issues. It’s just food. You have to follow it fanatically to work, but you might try it. Thank you so much for the information. I am going to look up that book now. After having this on and off my entire life, the last seven years being the worst, I got teary when I read this, Aside from the vertigo, I could’ve written this. Thank you so much for sharing. I’m sorry you are suffering from this ailment. Thank you for taking the time to leave a comment. May there be better days ahead.